Hey! Are you looking for the best single zone wine cooler? Then, Don’t worry check the latest review on Top 5 Single zone wine coolers online. When I first started to search for buying the wine cooler, I have no idea about cooling zones. So, I enjoy both white and red wines preserving in the single zone wine cooler. There are many top rated single zoned wine coolers in the market with the latest updated technologies. Through my extensive research, I have shortlisted few best wine coolers on considering some important features like cooling technology, Temperature range, and bottle capacity. So, If you are new to preserve your wine in wine cooler and looking for the best budget wine chillers, this Wine Cooler review will be very helpful to you. Coming to the models, Here is the list of top 5 Single zoned wine cooler. 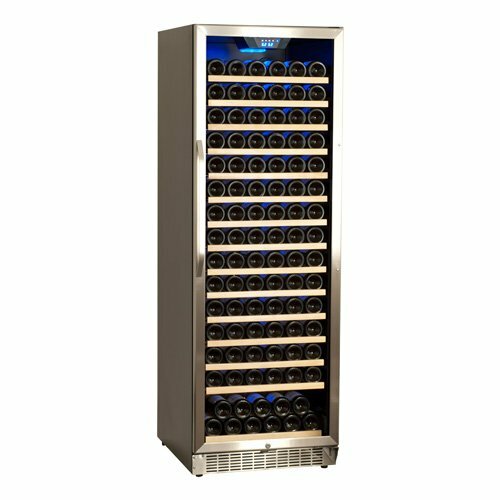 The Avanti 166 Bottle wine cooler tops the list with extensive storage capacity. This single zone wine chiller can store upto the 166 bottles in the wine fridge very easily. 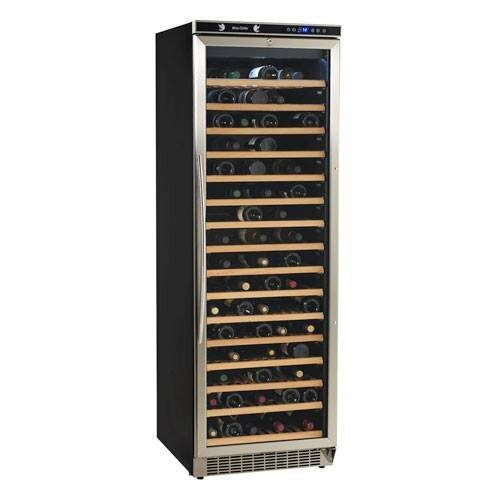 As the storage capacity is great, it is perfectly suitable for the enthusiastic wine lover who offers frequent parties at home and also we can also keep this wine chiller in bars and restaurants. On moving to the details, I seriously love the way that the Avanti wine cooler is designed. It is a decent wine fridge with black cabinet designed with stainless steel door handle and frame. It has a double-paned door glass that is a made of the tempered glass which allows us to have a perfect interior display of the wine chiller. The interior wooden shelves are movable and give the elegant appearance of the entire unit. The unique feature of this Avanti wine cooler is the internal LED lighting which we can on or off by the switch present at the bottom of the wine cooler. It also comes with the security lock, and there are no worries about the safety issues of this wine cooler. So, Finally, we can say it is a beautiful collection of the wine enthusiasts and newbies who love to store wine for a long time. If you are interested in more Avanti brands then check out here. It is a free-standing wine cooler. It uses compressor cooling technology. The height of this wine cooler is 71, width 23 1/2 and the depth is 26 3/4. It also weighs a hefty 238lbs before you store anything inside so bear this in mind when you’re choosing a space for it. 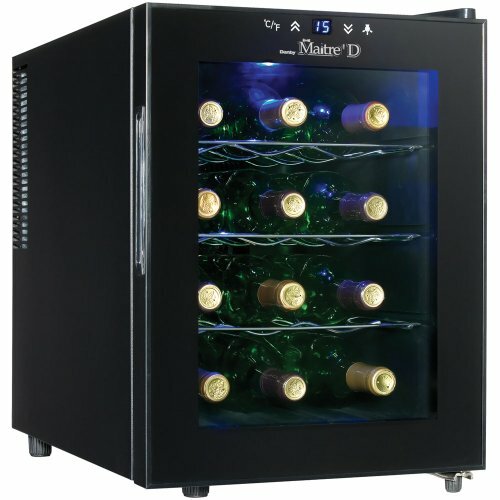 The EdgeStar 166 bottle wine cooler is the best brand collection of the EdgeStar wine chillers. The temperature range of this wine cooler is 40 to 65 degrees. It can be used as both built in as well as free-standing application. The tinted glass protects the wine cooler from UV rays. As exposure to UV light can change the chemical makeup of your wine, it potentially affects the taste and aroma. The transparent glass door ensures that your wine bottles are visible and safeguards our wine from external damages. One of the unique elements of the cooling system is the controls. They should be accessible, easily understood, and provide you with accurate information on the exact temperature you are desired to set in the wine cooler. So, Finally, the smooth touch control and digital temperature display allow you to easily adjust and monitor the desired temperature based on your specific cooling needs. Coming to the shelf arrangement, This wide shelf layout will allow you to achieve the maximum bottle capacity i.e., 166 bottles which are extremely great. 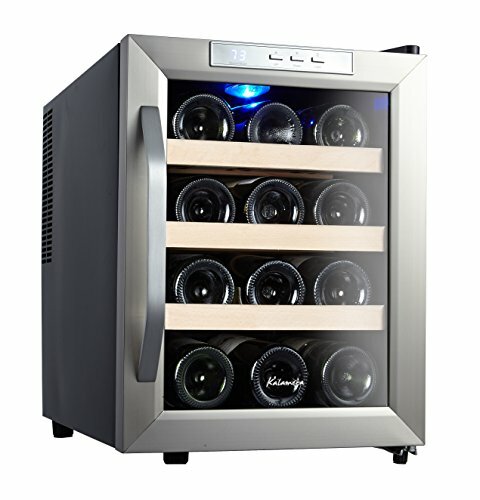 The unique feature of this wine cooler is it allows the even cooling strategy which cools all the bottles evenly at the desired cooling temperatures. Keeps your wine at the temperature you desired. Highly recommended for the enthusiastic wine lover. Solid construction with elegant design. The dimensions of the wine cooler are 69 1/2″ H x 23 7/16″ W x 26 3/4″ D.
The Whynter 28 bottle wine cooler is one of the cheapest wine coolers with all the impressive features. The price of this wine fridge is $242.41. It has LED display at the front, and the temperature controls can be easily accessible. But the only point here is the temperature can be displayed either in Celsius or Fahrenheit. So, it is a bit confusing for the newbies who recently bought the wine refrigerator. This whytner Wine Chiller runs using thermoelectric technology which silently runs wine cooler with low noise and vibrations, and it is an eco-friendly wine fridge with no CFCs emission. It also has an adjustable thermostat for storing the different wine varietals between 52 to 64F. Finally, I can say that this wine cooler is suitable for the newbies who are eager to own a new wine cooler. Protection Cylinder locks with keys. Enhanced Blue Light LCD with the temperature display. The dimensions of the wine cooler are 18″ W x 20.5″D x 29”H. The Danby’s 12-Bottle Countertop Black Wine Cooler safely preserves your wine bottles on three contoured chrome shelves. This single zone high efficiency cooler is an Eco-friendly wine chiller with no harmful refrigerants. The cooling system uses thermoelectric technology which is silent and vibration-free, so your wine is safer. The dandy wine cooler stores your wine bottles at the perfect storage temperature between 50-65F degrees 10-18C. It also has an interior blue LED lighting system which adds an enhancing look to your wine chiller. This Blue LED interior light can be turned on or off according to our requirement. 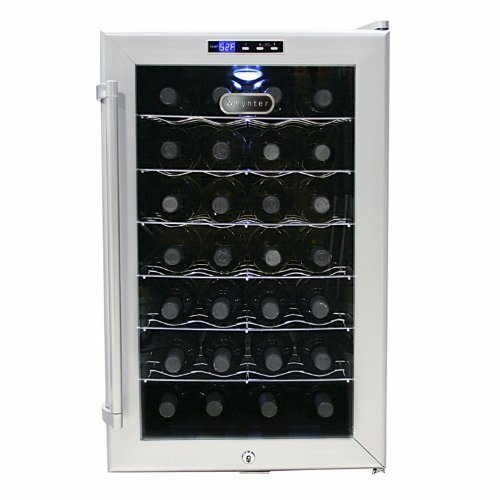 The 12 bottle Danby wine cooler is available in black color with an affordable price i.e., $90.53. The capacity of this wine cooler is 1.17 cubic_feet. The storage capacity of this wine chiller is 12 bottle which is a bit low. So, consider your requirements before buying the product. It has reversible door hinges. It has 3 shelves with glass door. The dimensions of the wine cooler are 51 x 34 x 46.8 inches. The Kalamera 12 bottle wine cooler is a Countertop stainless steel wine cooler with 12 bottle storage capacity. It is absolutely suitable for the small family who drinks wine occasionally. Coming to the features, It runs with thermoelectric cooling technology with low vibrations and no noise. It has an Easy to Control Temperature Display unit. The wine cooler maintains the temperature between 50~66ºF. As it is a single zone wine cooler, we can store either red wine or white wine. The Digital control makes it easy for you to keep wine at the perfect temperature for maintaining proper aroma and taste. It is designed to be compact, lightweight and fits on counter top. The storage capacity of this wine chiller is 12 bottles which are suitable for small family. It is a countertop wine cooler available in black color. It has a reversible glass door. The dimensions of the wine cooler are 20 x 13.4 x 18.4 inches. The price is also considerable, and it is $99.00. Hence, here is the list of Top 5 Best Single zone wine cooler with all the advanced features. Based on your storage capacity of wine bottles and budget. You can choose the best single zone wine cooler. In my opinion, If you are a newbie to buy a wine cooler and occasional wine drinker then this single zone wine cooler perfectly suits your need. So buy the best one with all the essential features you required. Hoped my review is helpful to you in selecting the best single zone wine cooler.